Where is the Kansas Scrap & Quilt Retreat? 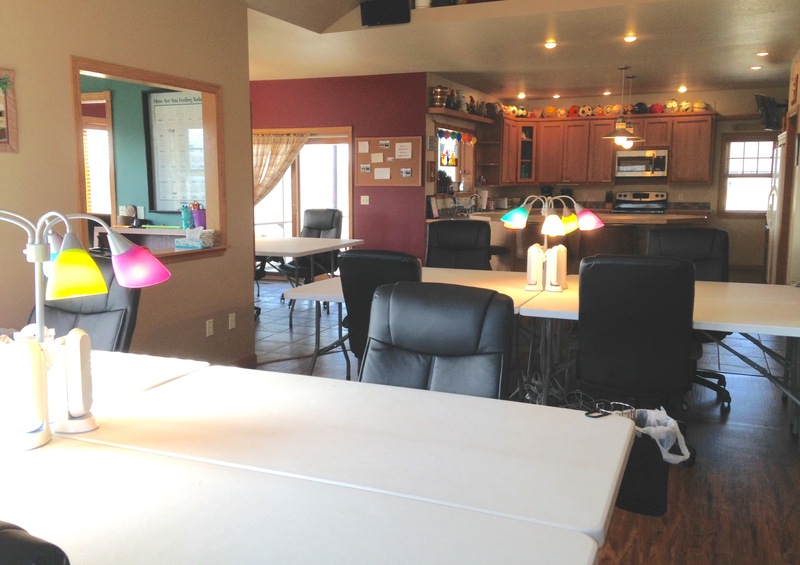 The Kansas Scrap & Quilt Retreat is located just north of Valley Center, Kansas. Valley Center is a few miles north of Wichita. Check-in is any time after 4:00pm on Thursday & check-out is by 4:00pm on Sunday. However, modifications are usually possible, if arranged prior to visit. Can I reserve the retreat for things other than scrapping or quilting? Absolutely! All kinds of crafters are welcome – we have space for scrapping or card making, quilting, knitting or crocheting, sewing, jewelry making… We are also a great place for a bible study group/spiritual weekend or just a weekend get-away with your friends! What is my work space like? Every person has a 5' table and a comfy chair, along with an Ott light, cup holder & trash bag. There are outlets available at every table. We have a large variety of tools, including a cricut and cartridges (bring your own mat), Sizzix & die-cuts, scissors and punches, stamps (bring your own ink), paper trimmers, quilt design wall, iron and ironing board, & a computer and printer. Wifi is available. We also have a Swap Shop – feel free to take anything you might need – paper or stickers. Also, feel free to leave anything in the “Shop” that you don't need… There is a small supply shop on the premises, with Cricut mats, tape, glue, & cutting blades. Bring your toiletries and comfy clothes/jammies… Also, bring your crafting supplies! No food is provided. We do have a totally stocked kitchen – dishes, cups, silverware, bowls, platters, pots, pans, pitchers, plus a crock pot, toaster, & blender. There are 2 refrigerators, 2 stoves, & 2 microwaves (we have a large kitchen upstairs & a smaller one downstairs). We also have a coffee maker & a Kuerig (bring your own coffee & K cups; instant coffee is provided). 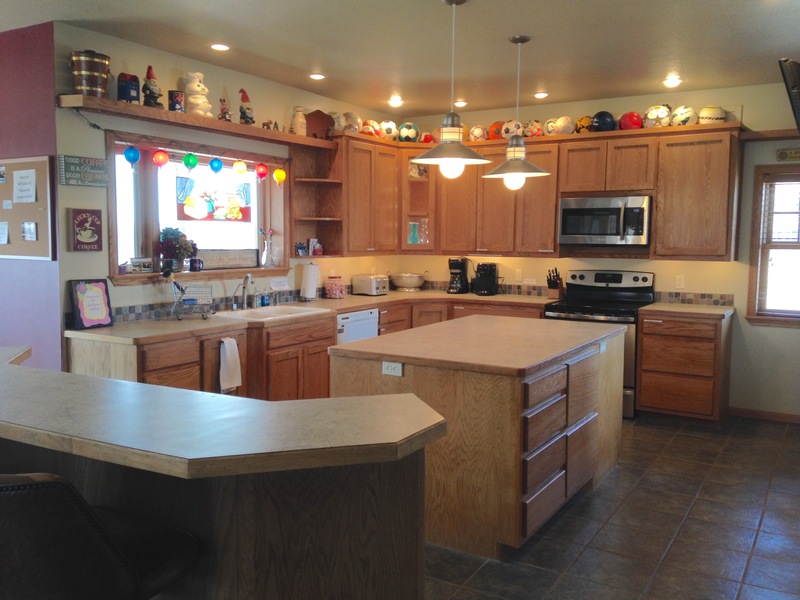 For more details, check out our “Kitchen” page on this website. There are 3 bedrooms, with 4 beds in each room. One bedroom is on the main floor; two bedrooms are in the walkout basement. Each bed has a pillow, sheet set, blanket, & comforter. Each guest is also given a bath towel and washcloth. There are many restaurants, stores, & shops in the area. You are only a few minutes away from Valley Center, as well as only a few miles away from surrounding towns, like Park City, Sedgwick, & Newton. Wichita is about 15 minutes away. For your convenience, a list of all places is at the Retreat. Do we need to clean before we leave? I will come in and clean when you leave. We do ask, however, that you load the dishwasher and run it please. Also, please place your sheets & towels in, or by, the laundry baskets in the bathrooms. And, finally, please take all trash out to the dumpster (by the barn). Thank you so much for your help – It is greatly appreciated!